Sunday has evolved into The Cat’s day to cook dinner. This past Sunday was her first encounter with Brussel sprouts. With a little instruction from The Mouse (via text messaging), The Cat created this. 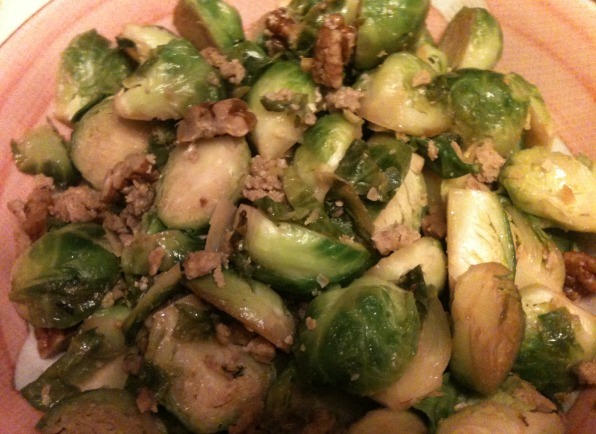 Brussel sprouts, pre-cooked ground pork, pecans. Actually pretty good. There was a little room for improvement, but overall good job. If this trend continues, we may have to get a bigger kitchen. Happy New Year all. Wishing you peace, health, prosperity, and hope. A little chilly (relatively speaking) today. 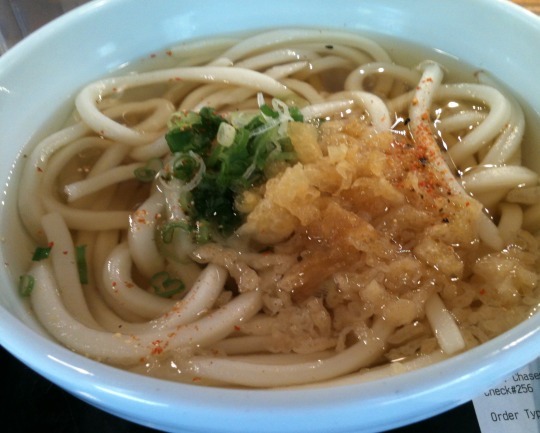 Good time to try the newish udon shop in town (Marukame Udon, 1104 Fort Street Mall, Honolulu, Hawaii). Interior somehow reminds me of a cafeteria at the bus terminal in Ningbo, China (sorry, no picture). The place offers udon, tempura, musubi, and a toss salad, all ala carte. Side note: The Cat is not too fond of udon, says it’s too thick and chewy. I went with the most basic of udon. And a little something something as sides. 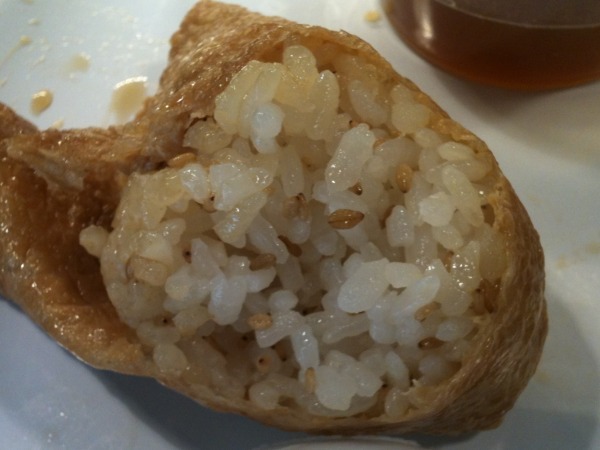 The inari (stuffed tofu skin (stuffed with rice)) used to be my favorite rice selection small kid time from the Japanese delicatessens (kinda still is). A little sweet, a little salty, with toasted sesame seeds. Yum. The tempura was standing a little too long. The udon was not bad. 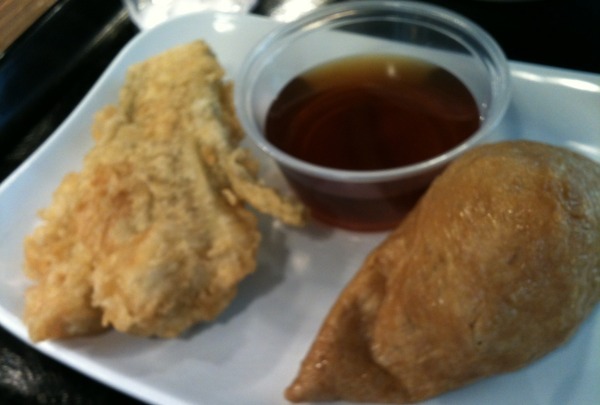 I think next time I’ll skip the tempura. Wouldn’t mind trying the other udon selections though, and of course, with a musubi. 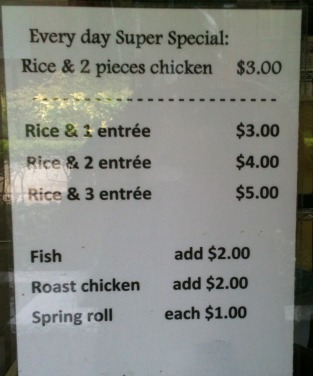 Here’s the menu, if you’re curious, http://www.toridollusa.com/menu-fortstreet.php. Continuing the semi-regular posting of my snack before heading off to do part-time church work. No musubi today. A new Japanese sweet shop at the mall. 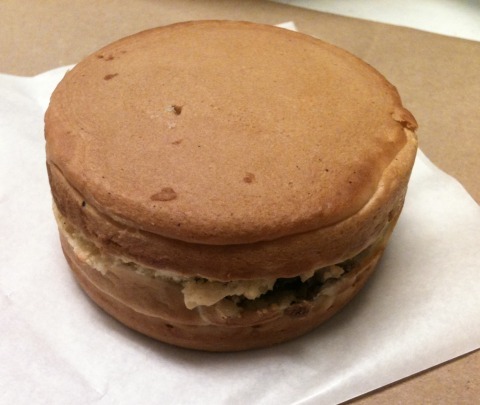 According to their website, the shop specializes in sweets for the Japanese tea ceremony. 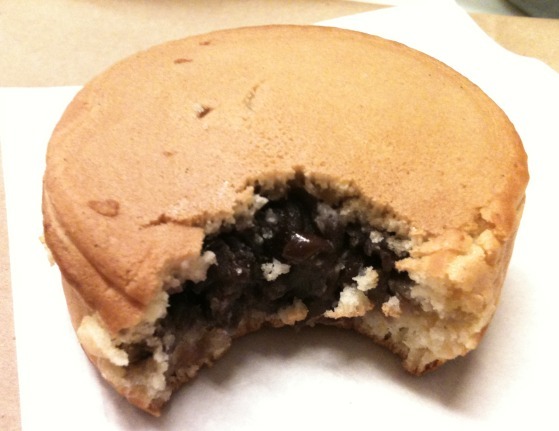 Been inside a couple of times, each time the “stuffed pancakes” (at least that’s what I call them) are sold out (comes filled with either red bean or chocolate). Must be my semi lucky day today, the chocolate was sold out but they had two red bean ones left. Not bad, not too sweet, lots of bean filling, must be eaten warm, just off the pan. Needed salad today. Guess my body is telling me something. A no recipe recipe. 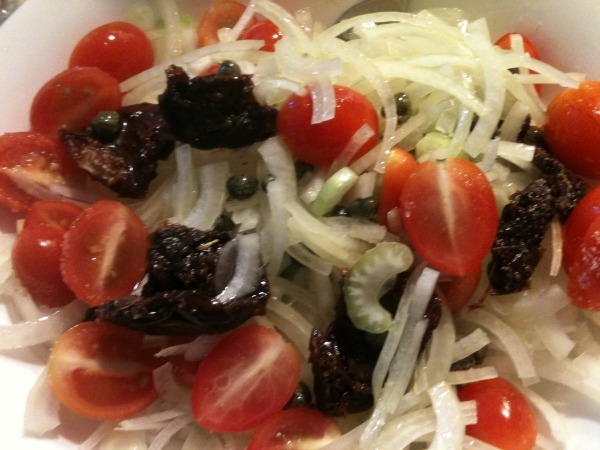 Thinly sliced onions, grape tomatoes, capers (with some of the brine), celery, and sun-dried tomatoes. Dressed with olive oil (the brine from the caper provided the salt and tartness). Some black pepper to taste. Turned out more like a salsa or relish than a salad, still worked. Next time I eat roast pork or steak, I making this as a side. Maybe just a little bit of goat cheese to garnish next time. Today’s plan was to try an udon place in town. The original shop is in Waikiki, always a line out the door. They recently opened a branch downtown. A little (not much) easier to access. The Cat doesn’t particularly like udon, so I figured it would be okay to try the place without her. But like a real mouse, I got sidetracked. On the way to the the restaurant, passed a hole-in-the-wall store front. No sign indicating name, steam table off to the right of the picture, in a doorway. What particularly caught my eye was this. 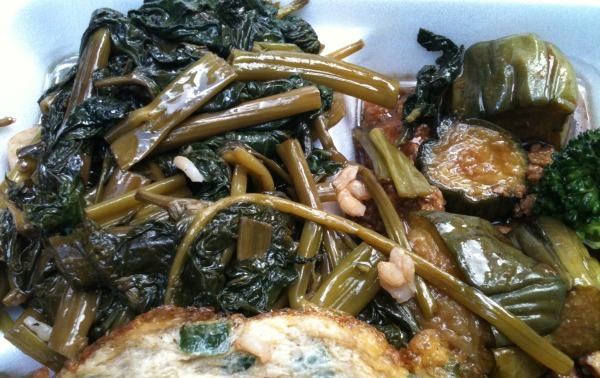 Being that the owner wanted to close, she offered to make a plate of whatever for $5.00. Sounds like a plan. The whole thing must’ve weighed at least a couple of pounds (three at least). 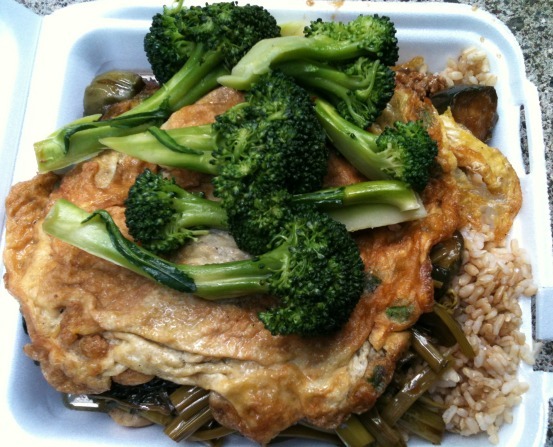 Brown rice, eggplant with minced pork, ung choi, vegetable omelet, and steamed broccoli. Huge amount of food. Only comment, and this is nitpicking, lots of fish sauce and garlic in the seasoning. Really had to brush teeth before my shift at Willie’s. 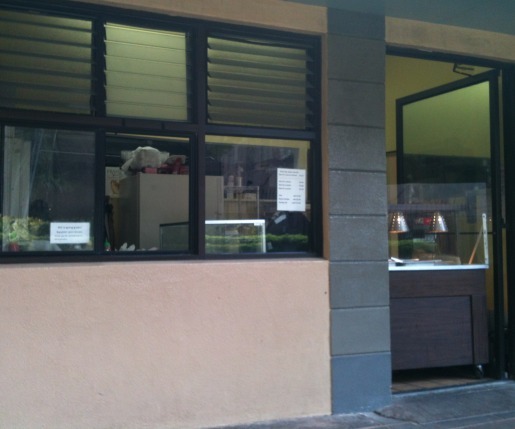 Given the opportunity, I would buy lunch from there again.